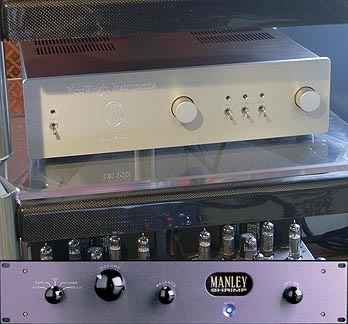 Preamp/Integrated: Manley Labs Shrimp, Blue Circle BmPH [in for review}, Audio Zone AMP-D1 [on loan], Pro-Ject Tube Box phono stage. Amp: Manley Labs Mahi monoblocks. Power Cables: Audience, GutWire, Harmonic Technology, DH Labs. Stands: Grand Prix Audio Monaco four-tier rack. Powerline conditioning: BPT Pure Power Center w/Wattgate 381 outlets, Bybee Quantum Purifiers and ERS cloth, GutWire MaxCon, Blue Circle BC6000 [in for review], Blue Circle BC86. Sundry accessories: Grand Prix Audio APEX footers, Herbie's Way Excellent II Turntable Mat, Herbie's Black Hole CD Mat, Herbie's HAL-O tube dampers, Isoclean fuses, Walker Audio SST contact enhancer, Nanotech Intron 8500 CD fluid, Audio Magic/Quantum Physics Noise Disruptors, dedicated AC line with Wattgate 381 outlet, Echo Busters acoustic room treatments. Room size: 11x18x8, long wall setup, hardwood floors with large area rug. I've listened to a number of preamps over the last several months. I can't say that one made listening to music any less captivating and enjoyable than the other. Sure there were differences but nothing to get overly animated over. Truth be told, I find the subject of preamplifiers a trifle boring. I tend to get more excited over integrated amps that punch well above their weight and at a fraction of the cost of separates. Besides, integrateds have improved immensely over the last couple of decades. That's just my inner integrated amp guy trying to get out. Patience my friend, your turn will come shortly, with Gilbert Yeung's BmPH and Audiomat's Opera Reference just around the corner. However, this little Audio Space line stage impressed me greatly, more so considering its attractive price. Dare I say it's a steal? Familiar to those living in the Far East for over ten years, Hong Kong-based Audio Space is only just starting to penetrate the North American market. 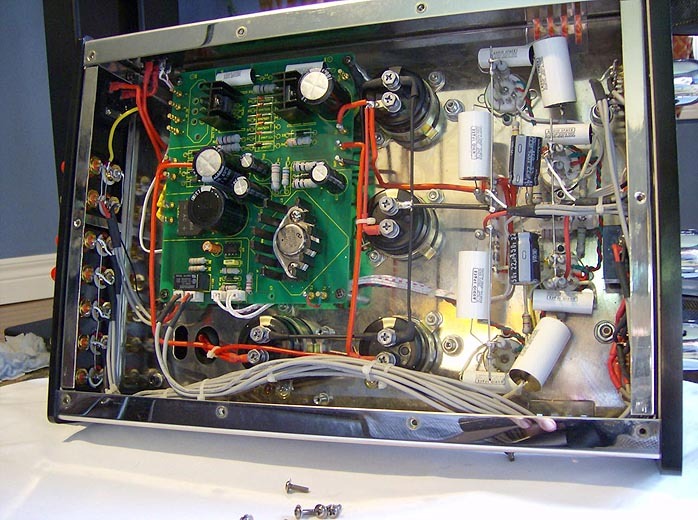 I reviewed one of Audio Space's integrateds under their Houston banner four years ago and fellow moonie Steve Marsh covered the 6M 300B push-pull monos back in February 2006. Audio Space is currently imported into North America by Charisma Audio in Canada and by Gini Systems for the US. The Line-2 is an attractive minimalist line stage that weighs in at 8kg and measures a compact 250mm (W) x 150mm (H) x 335mm (D). There are single-ended RCA connections for four sources, two outputs plus a tape loop. Also on the rear panel is an IEC inlet and a ground post. 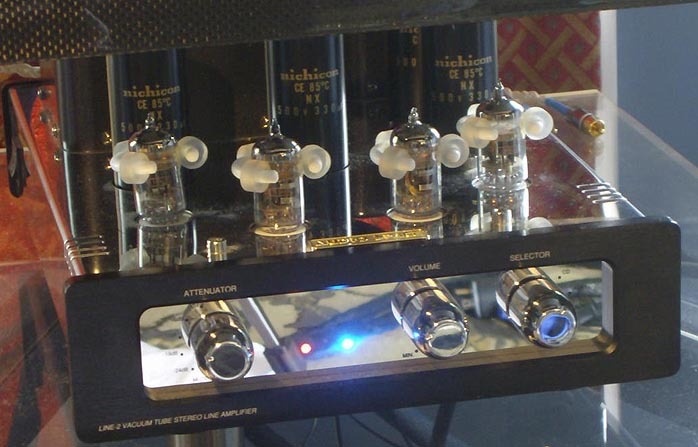 Tube complement is two 12AX7s and 12AU7s each. Behind the tubes are four hefty looking caps followed by two housings containing an EI style transformer and a choke coil. Output impedance is 2.5kOhm while the input is 47kOhm. The three front panel knobs control gain, volume and source selection. The gain control is a six-position selector ranging from mute to 0dB in 6dB steps i.e. 0, -6, -12, -18, -24 and mute. I generally preferred the -6 or -12dB settings with my Manley Labs Mahi. The power on/off switch sits at the left side rear of the chassis, the polished stainless steel chassis on compliant Sorbathane-like hemispherical balls situated in the center of four cylindrical footers. 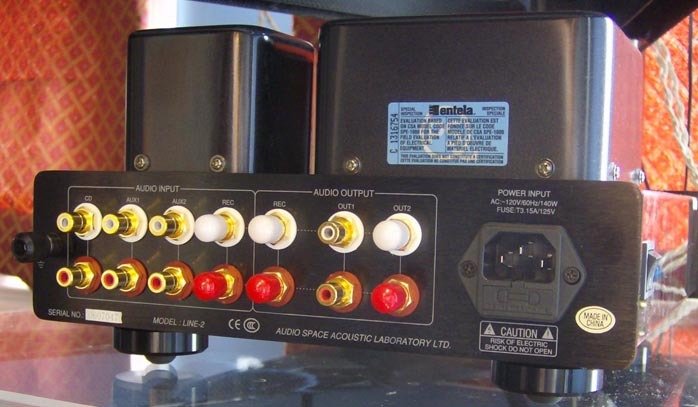 As with most modern preamps, there's no phono stage, tone controls, mono or polarity switches. Ah, to have all this in a decent sounding preamp for under $3,000. hum were essentially non-existent. My dad has owned an Audio Space integrated for four years with zero issues. Indeed, with a little digging here and there, it appears that Audio Space enjoys an excellent reputation in terms of build quality and reliability. You might not cotton to the Audio Space sound but you can't knock the build quality of this gear. During the review, I swapped out the stock power cord for a Harmonic Technology AC-10 Fantasy which offered a slightly quieter background with less line hash. Power amps included my Manley Labs Mahi and the Hypex-fueled Audio Zone AMP-D1 stereo amp. Speakers were my Green Mountain Audio Callisto while the soon-to-be-reviewed Green Mountain Audio Calypso and very wallet-friendly AV123 Strata Mini also made appearances. Cabling were mostly SilverFi's excellent silver alloy designs. Primary sources were my Pro-Ject/Ortofon rig and Zero One's excellent Mercury CD/HD hard disk player. The Line-2 presented music from a darkly quiet background devoid of low level noise, tube hiss or hum. This was one quiet preamp. There was plenty of musical detail, the subtle kind that made for long enjoyable listening sessions and not the sort that overwhelms you with an overabundance of treble energy that some mistake as high resolution. The Line-2's tonal balance leaned a little to the warm side, just enough to add a little cream to this fine tasting cuppa Joe. Otherwise I didn't hear any weird tonal aberrations. There was also a typically tube vibe with this suave Asian in that the presentation was smooth, open, textured, easy on the ear and didn't exaggerate sibilance or was unkind to poor recordings. The Line-2 relayed the natural flow of music without mucking it up with HiFi fireworks or the bland sterility that seems to plague most gear these days. Frankly, I'm sick of tube gear that attempts to sound like solid state. Why would anybody want that? Well, here's a preamp that embraces its inner tubular self unabashedly and lets it all hang out. It definitely possessed an additive effect like most if not all decent active preamps, particularly valved ones. I think a good preamp should add dynamics and a bodacious sense of presence and punch without reducing transparency or speed. The Line-2 did all that. Bass notes didn't lag nor did timing suffer. I didn't feel I was missing out in the detail department either. The Line-2 reproduced believable string tone from various classical recordings I played. Vocals were ravishing. It also conveyed the excitement and sense of event with recordings. There was plenty of drama and scale in big orchestral war horses such as Lenny's Mahler 2 [DG 423 395-2] which was suitably massive and overwhelming. But then there was intimacy and delicacy on small chamber recordings such as Schubert's Trout Quintet [Decca CS 6090]. The selectable gain control was an interesting and flexible feature. It also made nailing down the preamp's character tricky as I could alter it with a mere twist of the gain control. Initially I set the gain at -18dB which offered warmer, softer more relaxed sonics. By cranking it up to -6dB, I achieved a tighter and gutsier presentation. As with selectable feedback and UL/triode settings on some tube power amps like my Mahis, this can be a source of endless knob twiddling frustration for some or sheer joy for others. Personally, I relish the option of tuning my system to whatever strikes my fancy. For those fans that've missed the piss and vinegar of Nick Cave circa The Birthday Party era, you will love Grinderman [Anti 86861-1], a raucous return to the glorious noise of old. On this recording, some of the sharp edges where slightly rounded off in favor of a fuller, more weighty and even dirtier quality. But then I could alter it simply by increasing gain. Either way it kept the neighbors away. frequently humorous music of the late György Ligeti [DG 477 6443]; and an amazingly clean and lifelike recording of a 1971 Neil Young live solo performance at Toronto's Massey Hall [Reprise CDW 4332]). I've seen tons of performers at Massey Hall over the years and it's uncanny how much of that building's unique acoustic is captured here. Recommended by my dealer pal Robert Doughty at Applause Audio, I've been listening heavily to Big M, Kalil El-Zabar's tribute to bassist Malachi Favors. Also seeing lots of time was an old favorite CD by pianist Vladimir Horowitz [Sony SK 45818]. His reading of Liszt's transcription of the "Liebestod" from Wagner's Tristan und Isolde is transcendent. had a significant and wholly positive effect. I noted less glare not that there was much to start with, and dynamics were also improved. Playback was more focused with a little more detail retrieval. I can only surmise that the open top-mounted layout of the Line -2 with its exposed tubes was more susceptible to airborne vibration. Oddly, I don't notice the same with my Manley Labs Mahi which also has exposed tubes. As with any tweak, there are no fast and hard rules. Experimentation is the key. Your mileage may simply vary. Late in the review I was able to borrow the highly regarded ModWright SWL 9.0SE (CDN$3200) from the boys at Ovation Audio for a little three-way action. Incidentally, Ovation carries both ModWright and Audio Space. To be perfectly honest, I could live with any of these keenly priced preamps. However, they are different in presentation. The ModWright throws a big, robust, airy detailed soundstage with terrific micro dynamics and taut, snappy bass punch. There are no soft edges or looseness with this pre. This thing has some serious cajones. Its overall tonal balance was not quite as rich and textured as the Line-2 and Manley Labs Shrimp. Essentially it was fairly neutral, albeit leaning dangerously close to the bright and edgy hifi side of the sonic ledger. Audio Space. Mind you, I swapped out the Shrimp's stock 12AT7s some time ago for a pair of tasty NOS Mullards. The Line-2 was harmonically more saturated than the Shrimp or ModWright and sounded a little more organic and less electronic. I especially noticed this on vocal recordings such as Mark Padmore's recitals of Handel arias [Harmonia Mundi HMU 907422] where his voice was purer, fuller and essentially more real or more 'there'. If you're looking for a cleaner, more detailed and neutral sound, you'll probably prefer the ModWright. However, I could shift the Line-2's balance closer to that of the ModWright by simply adjusting the gain control. With the Shrimp or Audio Space, you'll never doubt you're listening to a tube preamp whereas with the ModWright, you might question it. Of the three preamps, my overall favorite was the Line-2 with the ModWright and Shrimp following close behind. The Audio Space was also the quietest. But like I said earlier, all three are fine pieces in my opinion and should provide plenty of enjoyment for music lovers. Of course, part of the fun of tube gear is tube rolling. Charisma's Bernard Li lent me two pairs of Telefunken ECC82 and ECC83 valves and two pairs of Brimar ECC82s and 6057s (ECC83) to try. While the stock tubes are fine, I preferred the NOS, especially the Brimars. The Telefunkens offered up a cleaner, more open and detailed presentation whereas the Brimars displayed an even sweeter more romantic yet also more dimensional soundscape. I also mixed and matched between the NOS and stock brands. One brand or configuration wasn't necessarily better than the other but my personal choice was the quartet of Brimars. I just couldn't pass up on that lovely autumnal glow. Tube matching depends on the rest of your system and what you want from it. There are no hard and fast rules. 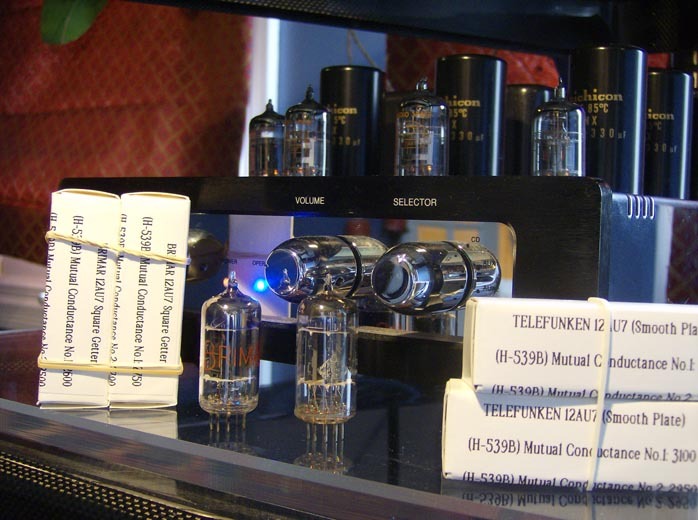 Bernard suggested NOS Telefunken and Siemens tubes for those looking for a more open, detailed and tonally neutral presentation. The Line-2 was impressive with its clear yet sweet and musical presentation. It offered a smooth, pitch-accurate presentation with good tonal balance overall - just ever-so-slightly shifted to the warmer side. It wasn't too much to turn music into sonic mush but just enough to add a little midrange juice. Transparency, texture, nuance and sweetness were terrific considering the price. A bit of a sleeper I think. I suspect some folks just might cast this little gem off as yet another Chinese knockoff of dubious origin and reliability. You'll be making a big mistake if you do. 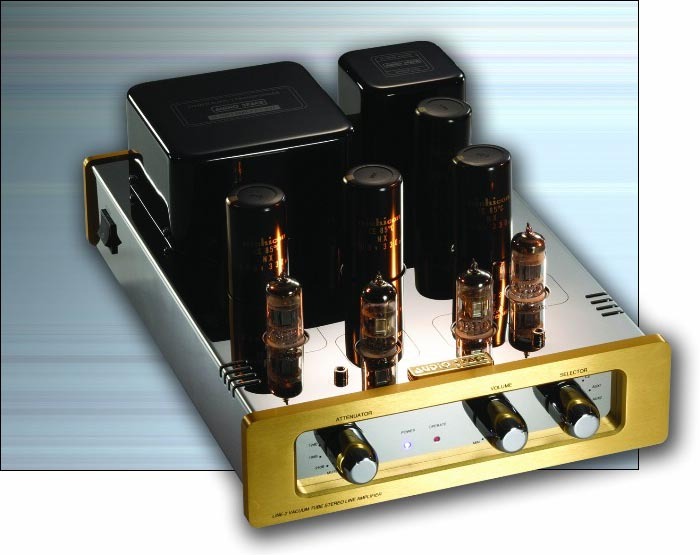 If I was looking for a nice little tube preamp for around $3,000, the Line-2 would certainly be on the short list. If it retailed for $6,000, I'd be a little more hesitant but for a buck shy of $2500? Awesome deal. Maybe set aside a few hundred smackers for a few NOS tubes, HAL-O tube dampers and tweak away to your heart's content. Way recommended! Quality of packing: Double boxed heavy cardboard, with cotton gloves and chamois. Website comments: Canadian site is informative with good quality pictures and pricing info. Human interactions: Always quick, professional and helpful. Pricing: No complaints and getting better as US dollar heads south. Final comments & suggestions: English translation in the manual was average at best. First of all, I would like to thank 6moons for giving our Line-2 preamplifier the Blue Moon Award. Furthermore, I would like to express my deep appreciation for Mr. Paul Candy’s review and praise of the unit. These definitely give our company a lot of encouragement and support. In the review, Mr. Candy mentioned our product’s adaptability, reliability, and performance, clearly showing that in his professional and personal observation we had succeeded in closely matching our design goal. 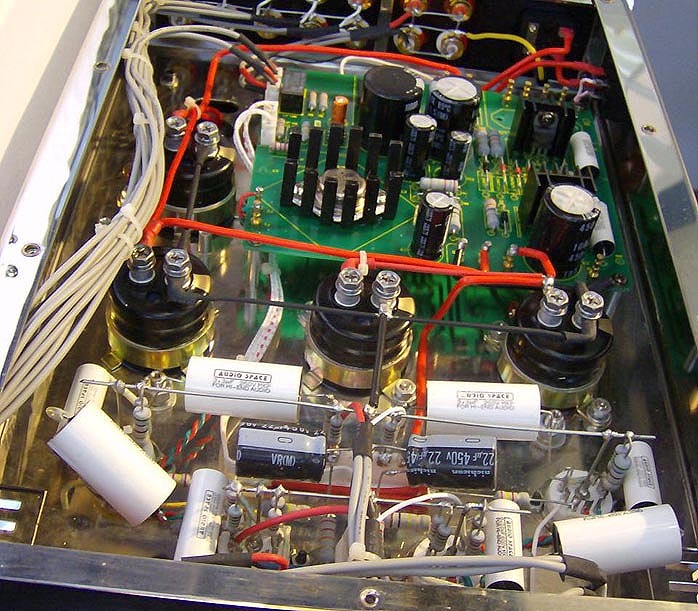 Regarding the design and manufacture of our tube electronics, both preamplifiers and line amplifiers give us the toughest challenge; grounding especially, but also hiss and hum noise arising from individual components. These noise problems, if not properly resolved, would greatly reduce the level of performance from music playback. Audio Space spent a lot of energy and resources between 1991 and 1999 researching the reduction of various noises generated from circuitry in different circumstances. Examples are thermal noise and microphonics from vacuum tubes, white noise from rectifiers and magnetic interference from transformers as well as noise from circuit traces which sit too close to components and wires that carry AC current (like cables from power On/Off switches, high current rectifiers, AC filaments etc.). As a result of great attention to the above, our products have a high signal to noise ratio. The specifications state that the Line-2 has less than 200uV of hum noise. However, actual measurements have shown that most of the units reach a figure of between 100 to 120uV. That’s why the musical background is extremely quiet. During the fine-tuning process of the Line-2, we pay most of our attention to the power supply. The results are a wide and deep soundstage, excellent layering with precise imaging and focus. For tonal balance, the unit employs our custom designed Audio Space metal film coupling capacitors, which have a very neutral characteristic. These capacitors do not have a strong personal character and do not overpower the original sonic of the vacuum tubes being used. In other words, the unit can clearly show the sonic differences amongst tubes during tube rolling. The design philosophy of the Line-2 is based on the phrase “The simpler the better”. Functions of the unit are simple and effective. 1. The tubes are exposed for easy tube rolling. 2. The On/Off switch is located close to the IEC connector in order to minimize AC line interference. 3. The gain control has six positions for matching the levels of different inputs. 4. There is a turn-on delay with a color-changing LED for preventing a release of energy from the output capacitors, which can cause damage to power amplifiers, especially solid-state amplifiers. 5. Dual singled-ended outputs allow bi-amplification. If you have any queries, please visit our web site or contact our distributors for further information. We hope that 6moons.com can provide its readers with a clear picture of the references and analysis involved in selecting a tube line preamplifier. We also hope that our products can give our users a memorable surprise.